Mean urinary oestrogen in a representative female (SB 112; 1987 to 1991), with superimposed reproductive behavioural data during the peri-oestrus interval are depicted in Figure 8.1. Oestrogen concentrations increased slightly by Day —12 (7 ± 2 ng mg—1 Cr), were eight-fold above baseline (19 ± 3 ng mg—1 Cr) by Day —6, remained at that level for four days and then peaked on Day 0 (63 ± 5 ng mg—1 Cr). Oestrogen excretion then declined, returning to baseline by Day +4. Scent mark behaviours began on Day —6, peaked on Day +1 and ceased by Day +3. Bleating was observed on Days —4 to +5 with a dramatic increase in number of bleats beginning on Day 0 (75 bleats), which were sustained through Day +4. Figure 8.1. 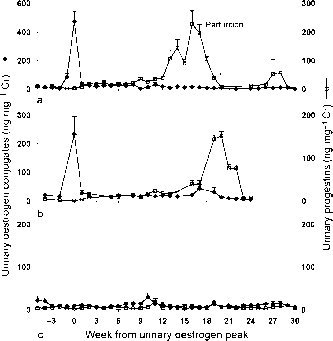 Mean ± SEM daily urinary oestrogen (♦) excretion (female SB 112, n = 5 oestrous cycles over 5 years) from 20 days before to five days after the oestrogen peak (Day 0). Frequency of scent marking (eees) and bleating (i i) also are shown. Figure 8.2. Mean ± SEM weekly urinary oestrogens (♦) and progestins (□) during a single representative (a) pregnancy, (b) pseudopregnancy (non-mated oestrual female) and (c) anovulation. 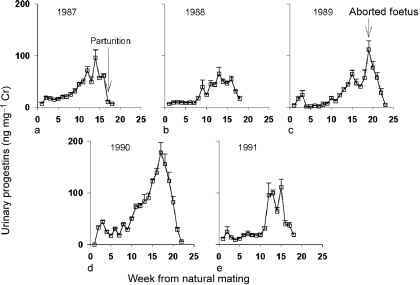 Values were aligned to week from urinary oestrogen peak (Week 0; a, b) or an arbitrary midpoint of the breeding season (c). Arrow denotes parturition. urinary oestrogen concentrations had increased (86 ± 21 ng mg—1 Cr) more than 20-fold above baseline (13 ± 4 ng mg—1 Cr, Weeks —13 to —2), peaked the next week (474 ± 72 ng mg—1 Cr, Week 0) and then declined to 25 ± 4 ng mg—1 Cr (from Week +2 to +8). Urinary progestins were basal from Weeks —13 to +1 (7 ± 3 ng mg—1 Cr), but increased three-fold (p < 0.01) after the pre-ovulatory oestrogen surge (24 ± 8 ng mg—1 Cr, Week +2 to +12). By Week +13, progestins exhibited a secondary three-fold increase (107 ± 31 ng mg—1 Cr; p < 0.05), whereas progestin excretion peaked during Week +16 (227 ± 47 ng mg—1 Cr) and declined thereafter, returning to baseline (8 ± 4 ng mg—1 Cr, Week +20) coincident with parturition. Urinary hormones in a 4.5-year-old pubertal female (SB 461) are depicted in Figure 8.2b. She was paired with a male but no mating occurred. Although inconsistent urine collection prevented a more precise characterisation of the temporal oestrogen rise and fall during peri-oestrus, mean oestrogen concentrations increased ~20-fold to peak during Week 0 (230 ± 150 ng mg-1 Cr) and declined to basal by Week +1. Proceptive behaviours, including bleating and chirping, commenced on Day -5, peaked on Day +2 and returned to zero by Day +10. Spontaneous tail-up and anogenital presentation behaviours commenced on Day +1, peaked on Day +2 and ended by Day +7. Mean urinary progestins remained basal (2 ± 1 ng mg-1 Cr) from Week —4 to +1, but increased subtly but significantly during the post-ovulatory interval (Week +2, 9 ± 4 ng mg-1 Cr; p < 0.05) through Week +16 (17 ± 3 ng mg-1 Cr). The secondary rise in progestin excretion occurred during Week +17 (38 ± 1 ng mg-1 Cr; p < 0.05), was sustained through Week +20 (152 ± 24 ng mg-1 Cr) and then declined steadily to baseline by Week +23. 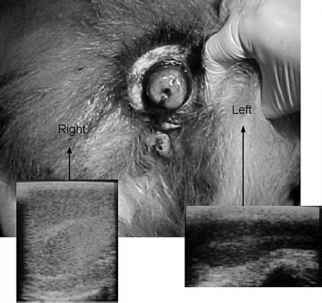 In 1999, an 11.5-year-old female (SB 332) exhibited oestrus and was artificially inseminated but failed to give birth. During the following (2000) breeding season, SB 332 failed to exhibit oestrus, and oestrogen and progestin excretion profiles (Fig. 8.2c) were indicative of anovulation. Because this female exhibited oestrus in 2001, the anovulatory cycle of 2000 was not due to reproductive senescence. It appears that fewer than 7% of adult, non-lactating giant pandas are likely to be anovulatory in a given year (Zhang et al., 2004). Figure 8.3. Mean ± SEM weekly urinary progestins in a single female, SB 112: (a) 1987, pregnancy; (b) 1988, mating, no birth; (c) 1989, aborted foetus; (d) 1990, mating, no birth; and (e) 1991, mating, no birth. Values were aligned to week from natural mating (Week 0). Arrows indicate dates of parturition or abortion. +9 to +14 before decreasing from Week +15 to +16 leading to parturition during Week +17. In 1989 (see Fig. 8.3c), an initial post-ovulatory progestin increase (Weeks +2 to +3) was followed by basal concentrations (Weeks +4 to +11) and then the secondary rise (Weeks +12 to +19), which lasted eight weeks. In the face of peak progestin excretion (112 ± 17 ng mg-1 Cr), abortion of a single foetus occurred during Week +19 followed by hormone decline to nadir over four weeks. 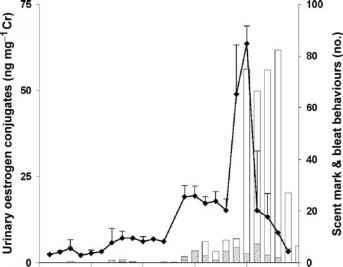 For all other years, progestins were elevated for seven-, eight- and five-week intervals during 1988 (see Fig. 8.3b; Weeks +9 to +15), 1990 (see Fig. 8.3d; Weeks +10 to +17) and 1991 (Fig. 8.3e; Weeks +11 to +15), respectively. Progestin concentrations then declined to baseline over two- (1988), four- (1990) and two- (1991) week intervals, respectively. Although no births occurred in these years, it is unknown if the intervals of elevated luteal activity represented pseudopregnancy or failed pregnancy. The validity of faecal analysis was demonstrated, in part, by comparing urinary and faecal oestrogen excretion in matched samples collected from a pubertal female (SB 473) across her inaugural peri-oestrual interval (Fig. 8.4; Day 0 = day of peak urinary oestrogen excretion). Basal faecal oestrogen concentrations were ~50 ng g—1 faeces while urinary oestrogen concentrations were <10 ng mg—1 Cr. Faecal oestrogens were increased above basal on Day —5, rose four-fold higher to a pre-ovulatory peak of 214 ng g—1 faeces (Day —2) and then declined to basal by Day +3. Although correlation between the faecal and urinary oestrogen measures (Day —25 to +16) was high (r = 0.87), faecal oestrogen peaked two days before urinary oestrogen. Matched urine and faecal samples were collected from SB 473 the following breeding season (2003), during which copulation occurred, but no birth (Fig. 8.5). Again, correlation between urinary and faecal oestrogen measures was high (r = 0.75; see Fig. 8.5a) but faecal oestrogen peaked one day before urinary oestrogen; both urinary and faecal oestrogens remained low thereafter. Urinary and faecal progestins were both elevated above basal on Day +2 (see Fig. 8.5b). A secondary rise in urinary progestins began on Day +82, peaked on Day +118 (188 ng mg—1 Cr) and returned to basal on Day +133 (3 ng mg—1 Cr). The secondary rise in faecal progestins was delayed until 25 days later (Day +109), peaked on Day +125 (24 mg g—1 Cr) and declined to basal by Day +131. Overall, the duration of the secondary progestin rise was considerably shorter in faeces (23 days) compared to urine (52 days).